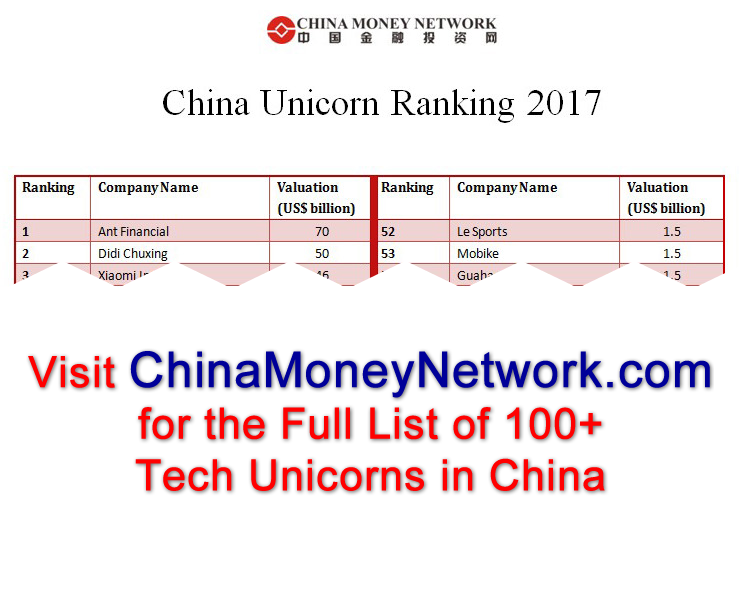 Beijing, China, May 9, 2017 /ChinaNewswire.com/ - China Money Network, the trusted news platform on China for millions of global investors, today launches its China Unicorn Ranking 2017, the most complete and up-to-date list of Chinese private companies valued at US$1 billion or more. With 102 unicorns, a term used to describe the statistical rarity of such successful ventures, China has a unicorn herd worth US$435 billion, just shy of Belgium's gross domestic product (GDP). If Chinese unicorns were an independent nation, they would form the world's 26th largest economy. 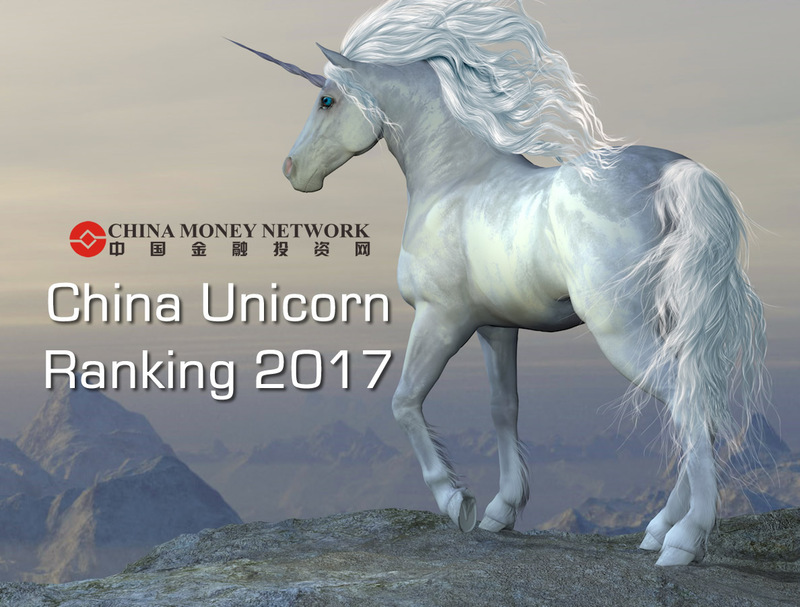 "We are proud to announce our China Unicorn Ranking today, which is the result of months of research conducted by our hard-working team," says Nina Xiang, editor and founder of China Money Network. "The rise of unicorns is truly an epitome of our time, in which private capital has grown its power to unprecedented levels and technology continues to reshape our imaginations of the future." In this debut ranking, the top ten spots are dominated by eight decacorns, a term used for private venture-funded companies worth over US$10 billion, including Alibaba's Ant Financial, smartphone maker Xiaomi Inc., ride sharing firm Didi Chuxing, Internet finance firm Lufax, peer review and group buying platform Meituan-Dianping, news app Toutiao, drone-maker DJI and Tencent Music. The power of Chinese tech giant trio, Baidu, Alibaba and Tencent, commonly referred to as BAT, is also evident throughout the list. Thirteen unicorns worth US$124.51 billion are directly affiliated or controlled by the BAT, taking 29% of the total in terms of valuation. Tencent, Alibaba and Baidu each have 22, 13 and 10 unicorns under their belt, respectively. Today, China Money Network is also releasing its ranking of Top 10 VCs Backing China's Unicorn Boom, which lists ten venture capital firms with the most unicorns in their portfolio. Sequoia Capital is the absolute winner, with 21 unicorns, while IDG Capital takes second place, with 15 unicorns in its portfolio. Matrix Partners China and Qiming Venture Partners tie for third place, each with 11 unicorns. Amazingly, two non-Chinese firms made the list, with Singapore's Temasek Holdings and DST Global, headed by Russian billionaire Yuri Milner, each having 10 and 9 unicorns, respectively. "Unicorns are a good barometer for technology and venture capital markets, and the ability to identify and invest in unicorns is a true testament to investors' visions and foresight," adds Nina Xiang. "Our ranking of the Top 10 VCs Backing China's Unicorn Boom shows clearly that the best investors are also those that have invested in the most unicorns." China Money Network is the go-to source of information and intelligence for millions of global investors looking to invest in the Greater China region. Started in 2011 as an investment podcast, it has evolved into a Hong Kong-headquartered independent professional media company offering compelling services to investment institutions worldwide with millions of visitors monthly and growing rapidly. China Money Network's services include real time coverage of China's venture capital, private equity and tech sectors; a top-rated audio/video podcast featuring prominent China-focused investment managers; an alternative investment manager database; offline events connecting top investors, a Chinese language platform ZhongguoJinrongTouziWang.com, and other value-added services bridging global investors with China opportunities.